We started at one web hosting company who boasted unlimited bandwdith on a shared server. Who knows that having unlimited bandwidth means nothing as you would never get the change to use it. If you were to use more than 500Gig in a month, that hoster would probably tell you to remove the file/iso that was being downloaded so much. This was my experience with my first web hosting company. They eventually gave me my money back and asked me to find another hoster. Having gone through that trouble I did a little more research before taking my next web hoster contract. I kept a copy of the transcript of the conversations I had with the next web hosting company. You see I asked the very specific question, "I plan on serving out Linux iso images on your shared server, would you guys have a problem with that?" to which he replied that they would not. I then told him more information about what I planned to do by saying, "It is very likely that I might use a couple of hundered Gig of bandwidth per day, are you sure that you guys are going to be ok with that?" His reply again was, "If I could use a couple of hundred of Gig per day then go for it." I was starting to feel more confident with this web hosting so I signed up after his reassurance that everything would be alright. After one week they changed the permission on the iso that was being downloaded so much in order to disable it. They would only change the permissions back if I was to do something in order to make sure that, that file would not be downloaded so much as it was causing using too much cpu usage. 2% I think is their limit. Being a shared server I couldn't access the necessary files. They did, however change the file permissions back and I was back in operation. This ocurred only for another week before management told me that I would not be allowed to stay with them and they were only to give me a refund. When I started at lunarpages I did run into similar problems at first. I now realise though that shared hosting is not setup to serve out large files and at such high bandwidth. Management heard about what I was trying to do in setting up Linux Freedom and they made me an offer I just couldn't refuse. 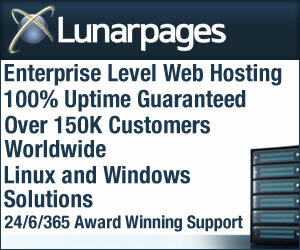 The offer was to work in partnership with lunarpages.com where they would give me a dedicated server in return that I advertise lunarpages.com on my website. Well I was so happy to get a dedicated server that I wanted to put larger ads on every page of my website as my way of saying thanks. The first server was their Dedicated III plan. I thought this might have been ok but the disk size wasn't large enough to host so many iso's so the Director of Business Development for Lunar Pages, offered me their Dedicated Hosting. Now remember this is all for free. Linux Freedom expanded very quickly to host 25 distributions and whilst the disk space was ample I was running out of the 4TB usage. I contacted Alfonso again to discuss the problem. He didn't hesitate to give me 40TB per month. This just gets better. As Linux Freedom grew in popularity that too wasn't enough so it was decided that I just be plugged directly into the main switches and not be counted. Now that's UNLIMITED BANDWIDTH. Linux Freedom enjoys true unlimited bandwidth via a gigabit connection. online chat with sales. These guys are absolutely the best.